Catch an all-new episode as Aaron walks us through the making of a country music album! Rock with Aaron at Ovation Guitars! Ovation: 35 years of excellence! Aaron and his wife Thea visit the Hartford Family Winery and are welcomed by the owners, their friends Don and Jennifer Hartford. Come along for the tour! This week it's "Hatch Show Print" (owned by the Country Music Hall Of Fame), where Aaron makes a poster: "GAC Presents Made In America, Starring Aaron Tippin"! Aaron visits Saturn's manufacturing facility! Created with one simple idea - to put people first - Saturn has earned a reputation for superior customer satisfaction. Join Aaron on his tour to see how one of these fabulous cars comes together and the people who make it all happen! Aaron visits a Las Vegas casino and learns the tricks of the trade the hard way. From BlackJack and Roulette to Craps, he gets insider tips from Las Vegas Dealers, Waitresses, Security Guards and Pit Bosses at The Orleans Hotel & Casino. He talks to dealers about "how to" play, and a pit boss about how people cheat . . . AND how they are caught! Adventurous host Aaron Tippin takes a journey nearly a mile underground - at times through a tunnel that's just 40" high - to get to the heart of a working coal mine! Tune in when Aaron visits U.S. Coal Mine #10 in Caryville, TN! Nestled in the heart of the Green Mountains of Vermont, Ben & Jerry's ice cream factory sits on a rolling pasture overlooking the Worcester Range, just north of the small town of Waterbury. Aaron Tippin spends time at their R&D (research and development) kitchen, tours the plant and even concocts his own ice cream flavor! Exquisite color, skilled craftsmen, and creative designs have made Blenko Glass, headquartered in Milton, West Virginia, famous in the craft of hand-blown glass. For over 100 years Blenko has maintained the tradition. Tune in and follow along with Aaron as he learns more about this ancient craft! Founded in 1852, Smith & Wesson is one of the oldest firearms companies in America! This year, S&W is introducing the biggest handgun in the world: the 500. Aaron hits the shooting range and tests out the 4 1/2lb., .50 caliber handgun personally! This week, Aaron visits Chillicothe, OH and talks trucks with Kenworth, a leading manufacturer of heavy and medium duty trucks. Kenworth sets the standard in quality, reliability and performance! Born way back in 1923, the company was named after two principal stockholders, Harry Kent and Edgar Worthington. Plus, you'll learn more about the fine art of furniture building when Aaron goes on location to Lexington Home Brands Plant #1 in Lexington, NC! Hey, NASCAR fans, join Aaron Tippin this week when he visits Richard Childress Racing (RCR). an RCR team has finished in the top 10 in NASCAR Winston Cup point standings 19 of the last 21 seasons! Visit RCR's official website for racing news, results, gift shop, Dale Earnhardt tribute & more! Aaron Tippin has a blast visiting NASA's* Johnson Space Center in Houston, TX! Explore along with him on GAC at the times listed at left. Plus, visit the Space Center's official website for more fun! Go behind the scenes with Aaron at the legendary Louisville slugger plant! Jack Daniel perfected his charcoal mellowing process back in 1866. It's the nation's oldest registered distillery! Tour the Lynchburg, TN plant with Aaron. Take a trip with Aaron to Blackhills, South Dakota, land of Mt. Rushmore, caves, five national parks, the Badlands and other natural wonders "beyond all expectations"! Chris-Craft is a legend. From rowboats to speedboats to the first combat landing crafts ashore at Normandy, they are the king of boat building. 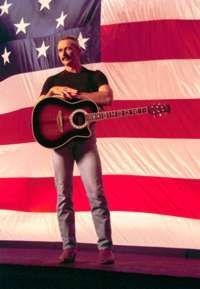 Hop aboard with Aaron Tippin! Aaron visits with the friendly folks at Southwest Airlines and introduces some of your favorite videos along the way like Gary Allan's "Right Where I Need To Be," actually filmed on an airport runway! � Copyright 1995-2003, Jones Media Networks, Ltd.